Is this low-cost miner worth the risk? 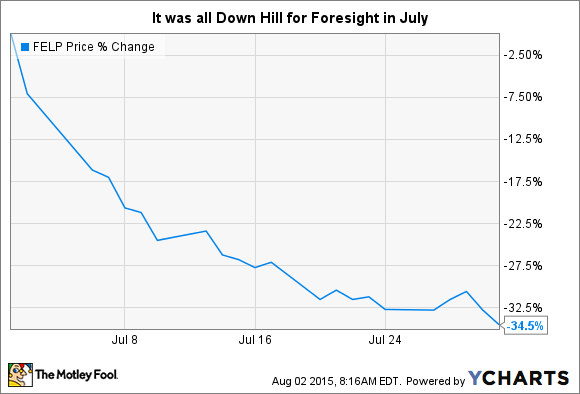 What: Foresight Energy LP's (NYSE:FELP) units fell nearly 35% in July. Ultimately, that steep drop was precipitated by continuing weakness in the coal market. But the shift that really drove investors through the exit doors was the bankruptcy, or rumored bankruptcy, of major industry players. Frightened that even some of the largest companies in the coal space were at risk of going under, investors simply sold with virtually no regard for what was being sold. So What: There's no doubt that Foresight is smack in the middle of the coal industry's storm, providing thermal coal to the power industry from its mines in the Illinois Basin. So low natural gas prices and the environmental push away from dirty coal are big issues for Foresight. However, the miners that have gone under so far are generally being pushed to the brink by metallurgical, or steel making, coal. Foresight isn't in that business. That doesn't change the fast that Foresight's thermal coal market is challenged. However, Foresight has some positive things going for it. First, it is among the lowest cost miners in a region that's seen increased demand in recent years. Second, it just got a new parent in private Murray Energy. That should lead to growth as Murray sells mines to Foresight, called drop downs in industry lingo, to raise cash. As for Foresight's business, although the top line was lower year over year, it sold nearly 4% more coal. And it's working to further reduce its already low costs as it starts to better align itself with its new parent. Moreover, suggesting that Foresight is navigating the downturn well, the board of directors increased the distribution nearly 3%—many struggling miners have cut or eliminated their dividends. Now What: If you are a conservative investor, don't bother with Foresight Energy or any other coal miner, for that matter. The risks that miners are facing today are quite real. However, Foresight is among a handful of industry players that appear positioned to do better than its peers. Clearly, that just means that Foresight is one of the cleanest dirty shirts, which is hardly a ringing endorsement. But if you are looking for a contrarian play in an out of favor industry, Foresight is worth a deep dive.